Descendants of William Barlow and Thomas Todd Cooley. On the anniversary of William Barlow's birth, 198 years ago in Wigan, Lancashire, England, 23 of his descendants gathered in Hobart to meet and exchange information. It was the first of what we hope will be many further reunions and was so successful that another was planned immediately. So.........an invitation is being extended now for the next planned event which will be in Swansea on or around William's 200th birthday - March 2002. We would love many more family members to come and join us at this time. 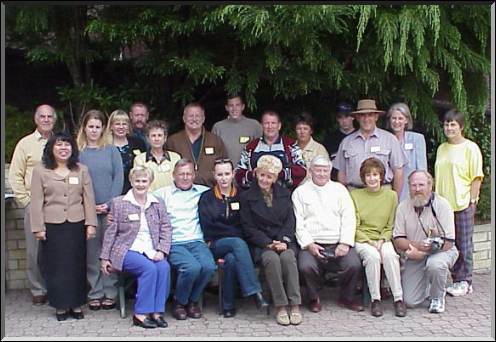 Here is a pic of almost all of us, (Kevin and Kerrie are missing) as we gathered in Mary's garden on the slopes of Mt. Nelson and smiled for about 10 cameras. More pics will be forthcoming as rolls of film are developed, so watch this space! Some mysteries were unravelled, for example the current home of the Family bible that William mentioned in his will. With some prompting I am sure that the owner will remember to bring it along to display next time! It was amazing the number of photographs and pieces of paper that came to light. A closer examination of William's will revealed a little more about his property called "The Hermitage". We are hoping to find out some more about this before we gather in Swansea, perhaps we may even be able to visit there. After seeing just how much information we have on the Barlow family, I came home feeling very enthused about actually finishing the story I began around 15 years ago. My plans are to continue publishing all my information on this web page and then when it is as complete as I feel I can make it, I will burn copies on to CD-ROM and make them available. I think it would probably be a good idea to publish in hard copy as well so I will investigate that. I want to keep costs down as much as possible so it won't be a "grand" publication by any means. I have been using a family tree program called "Reunion" to input names, dates and all the other genealogical facts that I have. After receiving more details on Sunday I can move ahead with that now too. I still have many gaps so if you want to contact me with your particular families information, I would really appreciate it. This program prints out charts and reports of all shapes and descriptions using the data that I input. Whilst looking at the family charts I have discovered that from the five children of William Barlow and Elizabeth Cooley, we had members of all but one line at the reunion! On behalf of all who met in Hobart, thanks Mary and Anne for the use of your beautiful home and for providing us with lunch, and thanks to Bruce for actually motivating and organising us to be together. I know that Ann and I really enjoyed meeting "new cousins" and look forward to staying in touch.